Well, as promised. I am giving you more ideas for a heart-themed party. My daughter actually planned this for her birthday party when she turned seven. Her birthday is in November, shortly after Halloween, so pink and red heart-shaped things are very hard to come by in a sea of orange, black and purple harvest items. Thank goodness she is a planner (a chip off the ol' block I tell you), and told me her idea for her birthday ten months in advance, so I could take advantage of all the 50% off Valentine sales mid February. This is one of my keys for thrifty party planning. If you know far in advanced what the theme will be, you can pick up sale and clearance items along the way, all year long. Well, the first thing we decided to do was get heart themed party items at the dollar store and of course Valentine's clearance. They had paper plates, napkins, favor bags and buckets, all for, you guessed it, $1 or less if you hit a sale. I always buy extra tablecloths to help decorate flat surfaces around the house. Just cut them to the width you need and you are good to go. Even these cute, extremely fancy bags were found on clearance. I will often use the bags or presents found in the theme in the entry of the party to add to the decor. These little buckets are filled with some garden foam blocks that had been cut into smaller pieces and stuffed with one piece of shiny tissue, a long dowel that had been cut to make many smaller dowels, and a foam heart shape taped on. I made a few of these and used them as centerpieces around the house. 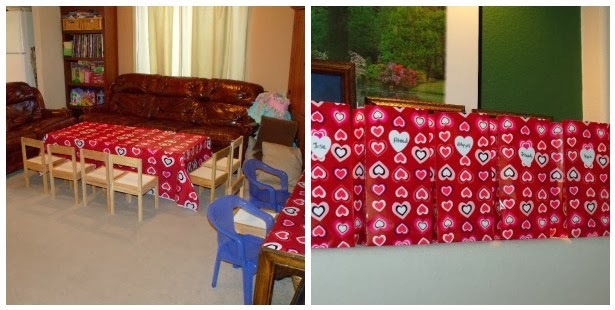 I used the same tablecloths and matching paper favor bags to add a cohesiveness to the rooms. The favor bags were filled with clearance Valentine's toys. Another mention about the decor. I found on clearance a TON of these adorable heart-shaped ornaments. I wasn't sure at the time what I was going to do with them... but knew I could use them somehow. You can't passed up $1 for 25 ornaments, right? Then a thought struck me a few weeks before the party. 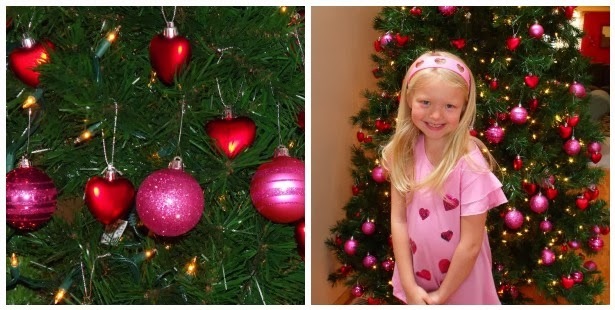 What if we put our tree up a month early (it was November) and deck it out with the mini hearts and some pink ornaments we already had on hand? It felt slightly wrong to put up the tree before Thanksgiving, but for this theme it really worked adorably. It made quite a statement as people came in the door. Plus it was a bonus, the tree was already up and ready to go for the Christmas holiday season. Oh, and by the way, it doesn't hurt to dress your birthday person in the heart theme as well. We knew we wanted a heart-shaped cake. I bought two heart pans in the holiday clearance for mere pennies (score!) But with friends from school, and then our big family coming later in the day, I would need more than one kind of cake. I had read in Family Fun magazine that year about an easy way to make heart shaped cupcakes as well, using a regular muffin tin and glass marbles. Click here for a full tutorial on how to make them. These were a BIG hit with the party goers. For drinks I served pink raspberry soda (sold in 2 liter bottles) but for added fun, a few days before the party, I made a ton of heart-shaped ice cubes from some silicone molds I got on clearance. I made them out of Crystal light strawberry orange banana flavor, but you could use any flavor. The kids really got a kick out of their heart-shaped ice cubes floating in their drinks. For food I went pretty simple. Sometimes our food themes go over the top, but this year it was simple sandwiches, chips, fruits and veggies. I try to put them on heart-shaped plates, and cut the sandwiches into hearts as well. For crafts, we had two. If you have a larger number of kids coming to the party, I have found it is sometimes easier if you have two crafts happening at the same time. Half the party peeps can do one craft in one room... and the other half can finish a different craft in another room. If you only have enough money for one craft, I usually make the other craft a stack of free printable coloring pages in the party theme. Having two crafts at once works well if you are tight on space. For example, in one room, we had a simple heart sticker craft, with foam letters and shapes. The kids had a great time designing their pictures. 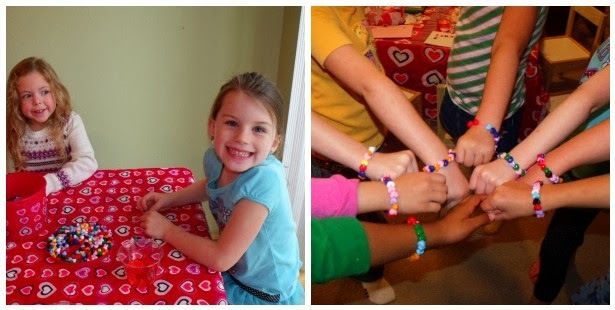 In the kitchen, we had them make bracelets with heart-shaped beads. Games! Of course what's a party without games? We always try to make our theme match the games we play. We had three great ideas. The first idea was to play the "Achy Breaky Heart Game". This was like "hot potato" only we had a heart that was filled with strawberry candy. We played Achy Breaky Heart as they passed the heart around. If they passed too hard, the heart would break open and they were out. If the music stopped when they had the heart, they were out (and of course were heart broken). If you are going to play an elimination game like musical chairs or hot potato, it is good to have a consolation prize. We said if you got "out" you were able to have a heart sucker. That way, no one really minds being out, and they are happy to enjoy a small treat while they watch the rest of the game play. The next game we played was the "Wandering Hearts Game". This was like musical chairs, only we had foam heart shapes on the floor and they had to walk around and land on a heart when the music stopped. We played "Queen of Hearts" for this song. My hubby, by the way, had a great time making a CD of music for the party with only songs that had the word "heart" in them. "You'll be in my Heart", "Heart Breaker", Don't go breaking my Heart", "Heart of Glass", Wild at Heart"... The third and final game we called "Love is Blind". 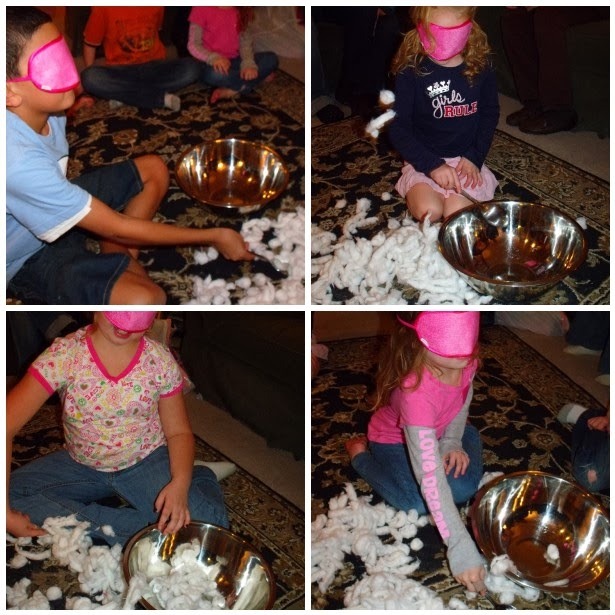 Players would be blindfolded with an empty bowl and a large spoon, next to a pile of cotton balls. They then had 30 seconds to try and find the cotton balls, using only the spoon and no hands. 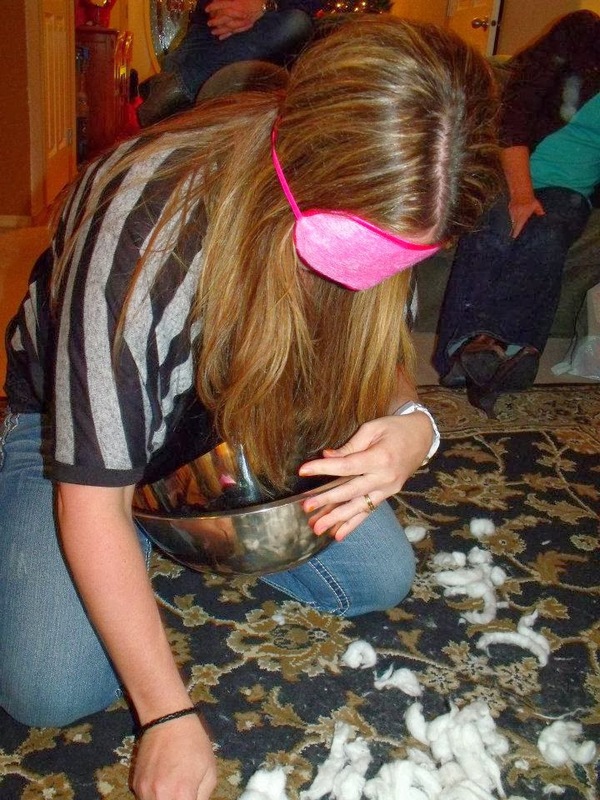 The cotton balls are so light weight, they are hard to feel, so you never know how many are going into the bowl. The kids loved this game. The people that are watching are laughing so hard at the people scooping up mostly air. A good time was had by all during this game. I highly recommend it. Matter of fact there was a few adults who took a very competitive liking to this game! The birthday girl's aunt Jenny really going to town on the Love is Blind game. After the games it was cake and present time! The party turned out to be a big success. I love it when you can plan way in advanced and really get a lot of theme, for not a lot of money. I also love the challenge of letting my girls pick a theme that is not necessarily a "normal" birthday party theme, where you can easily find plates and cups in the birthday section at the store. Having a "rainbow" or a "heart party" can be tricky. Working food, games, shapes, and crafts into your theme, while still keeping an end budget in mind can be challenging. 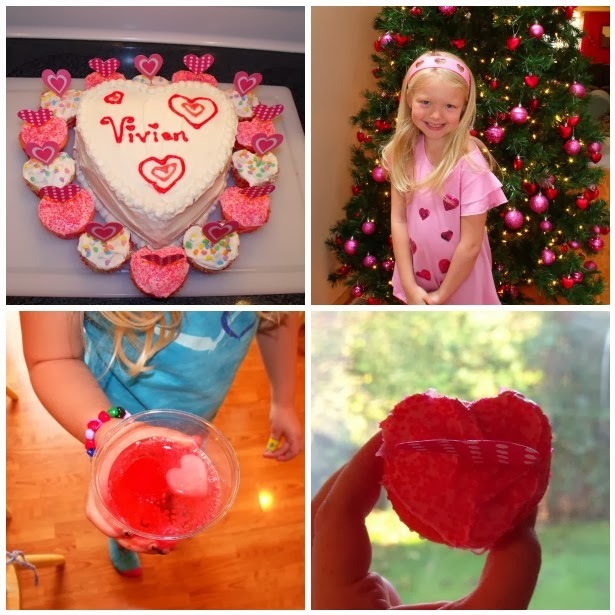 Feel free to use some of these fun heart-shaped ideas in an upcoming Valentine party at work or school. Enjoy!